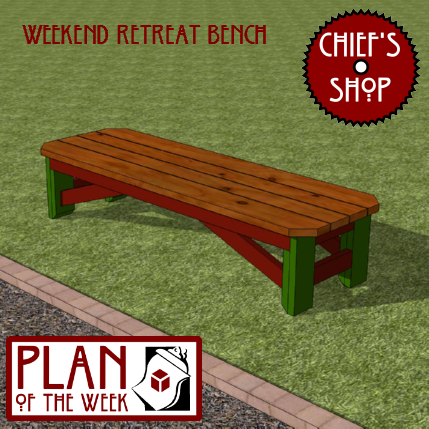 The Chief’s Shop Weekend Retreat Bench is probably the most stout and sturdy bench plan I’ve created. I designed it to withstand heavy use, but to be very easy to build. A couple of features, including the large brackets attached to the legs, are optional if you’re a beginner. The rest of the assembly is made from standard stock, pocket hole assembly, and a couple of laminated sections attached with deck screws. You’ll need a miter saw, drill driver, and Kreg Jig to build it. A table saw or jigsaw are optional. Download this free woodworking plan pdf file, which includes detailed instructions and illustrations, by clicking on the image at left.